Shops and services inside the airport. 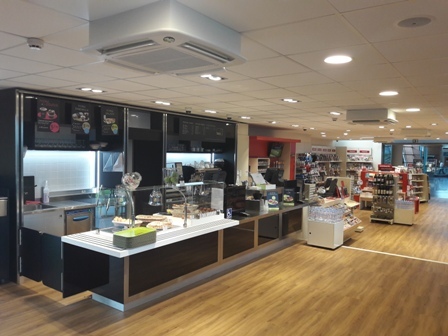 Pau Pyrénées Airport has launched an ambitious project to redesign and improve the shops, restaurants and vending facilities, located in the public area and in the boarding room. Before embarking, or during your visit at the airport, take advantage of our shopping areas on the ground flood (Relay) and in the boarding room. With a view of the runway and the Pyrenees, for your lunches, group meals or cocktails on request, discover the restaurant of Pau Pyrenees Airport. The Airport Restaurant welcomes you 7 days a week at noon (express or à la carte) and evenings on request and in groups. Several car-hire companies have offices at Pau-Pyrenees Airport, together with a fleet of some 400 vehicles in a specially-reserved car park. Please feel free to ask for information at their desks, which are located on the ground floor of the terminal, just next to the shops and restaurants. Pau-Pyrenees Airport offers free Wi-fi internet access for 3 hours and 400 MB. A free unlimited connection for the day is available on request. For more information, please contact the Information Desk on the ground floor. Information desk open from 7:15 am to 10:45 pm. Personal messages, announcements, tourist information. A Credit Agricole ATM machine is located on the ground floor. A post box is located on the ground floor of the airport, next to the shops. Located near the bar on the ground floor. Open from 6:00 am to 9:00 pm. A kiosk is located on the ground floor offering a selection of free tourist brochures. Go to the Information Desk on the ground floor. 2 lifts on the ground floor. If you need help with arrival/departure, please contact the Information Desk. or consult the "Persons with Reduced Mobility" section of this website. 2 ground floor locations (departures hall and departure lounge).